It is not unusual for scientifically-minded people to ask how it is that Christians can start with the Bible as a premise. It can be foreign to a mindset of empiricism and testing everything. But if one has enjoyed the experience of true communion with God while reading the words of scripture, this is compelling, albeit personal, evidence that the Bible is exactly what it claims to be–the Word of God. But we also have some wonderful evidence that God has given us regarding the authenticity of the Bible. In the coming months, I would like to review some of the fulfilled Bible prophecies. By sheer volume of words, the Bible is more a book of prophecy than any other single topic! This is no small thing because the rule God set down for Israel via Moses in Deuteronomy 18 was “But the prophet, which shall presume to speak a word in my name, which I have not commanded him to speak…even that prophet shall die.” So it was a risky thing to make a prophecy if God had not spoken to you! Not all prophecies involve fulfillment in ancient times. 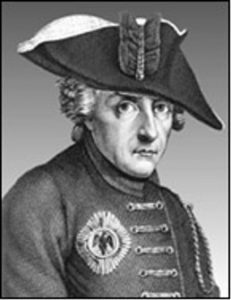 When the rationalist emperor Frederick the Great demanded of his court chaplain a single certain proof of the Bible’s authenticity, the answer was given:”the Jew, your majesty!” In keeping with the Moses’ warnings, the children of Israel were scattered (including the destruction of Jerusalem, the pogroms of eastern Europe and the German holocaust). But the prophets made it very clear that the Jews were to return out of the other nations and possess their land. “In the latter years thou shalt come into the land that is brought back from the sword, and is gathered out of many people…and they shall dwell safely all of them.” (Ezekiel 38:3 See also Deuteronomy 18:20-22.) It would seem highly unlikely that the Jews would remain distinct as a people, having no country and every motivation to intermarry and escape the stigma. Yet this Biblical prophecy has been completely fulfilled in recent history…from only 20,000 scattered Jews living in Palestine in 1900 to 7 million Hebrew-speaking Jews living in Israel today. No other nation and language has similarly been reborn after millennia! Posted on October 2, 2018 by dwoetzel.